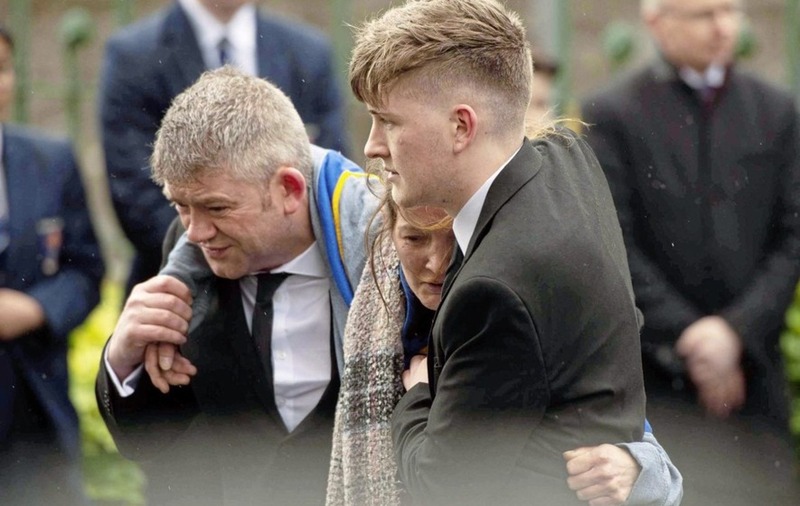 Morgan Barnard's mother is helped into St Patrick's Church in Dungannon during his funeral yesterday. Picture Mark Marlow. 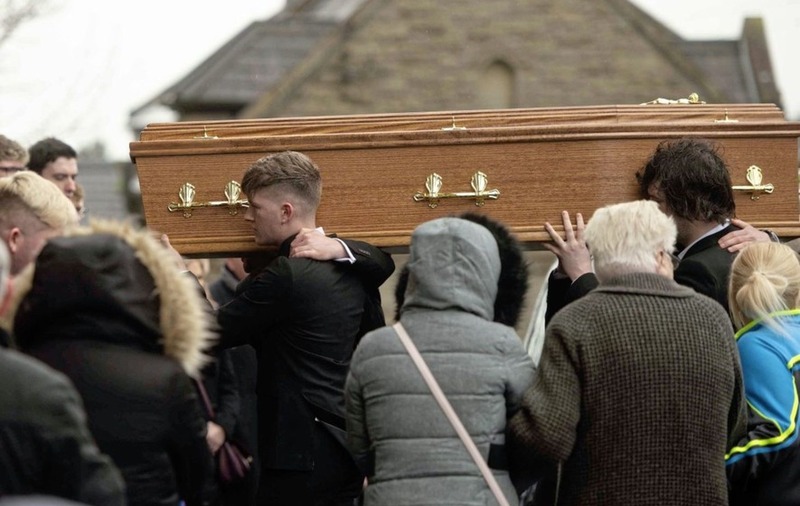 There were harrowing scenes at the funeral of Morgan Barnard yesterday as his devastated mother Maria was helped into the church by family and friends. Morgan was one of three teenagers who died in a crush outside the Greenvale Hotel in Cookstown on St Patrick’s night. The other two victims, Lauren Bullock (17) and Connor Currie (16), were also laid to rest yesterday. 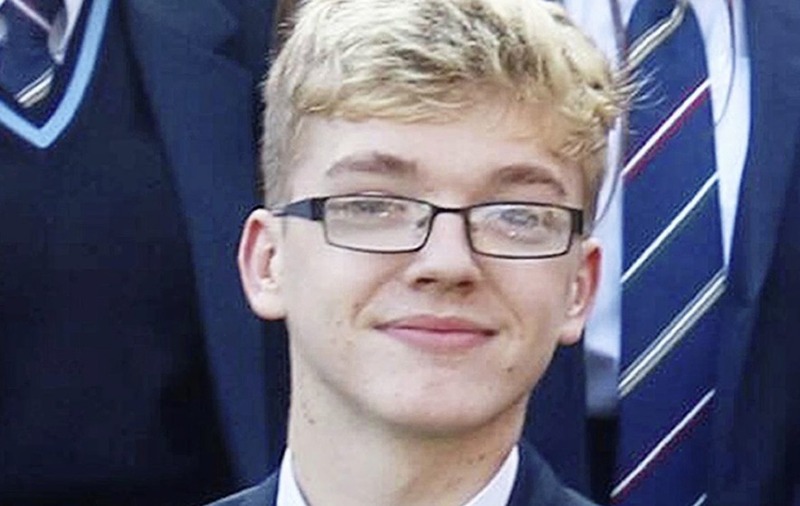 Hundreds of people followed the hearse carrying the 17-year-old’s remains as it made the slow journey from his Springdale home in Dungannon to St Patrick’s Church for Requiem Mass yesterday morning. Floral tributes adorning the hearse included the words ‘brother’, ‘son’ and another bearing the deceased teenager’s name. 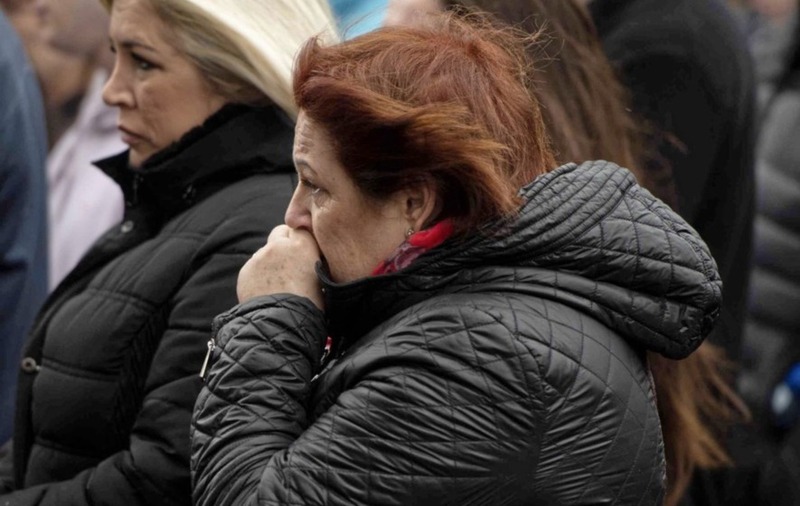 Light drizzle turned to rain as mourners stood in bracing winds to pay their last respects. 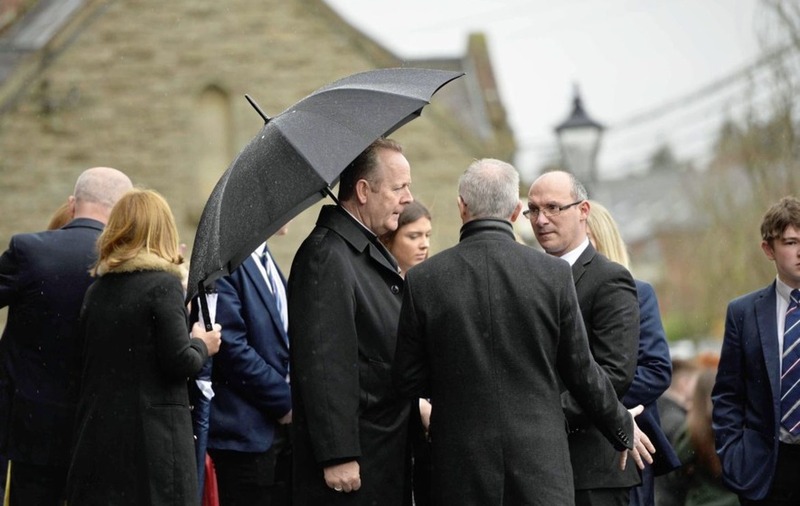 Archbishop Eamon Martin at the funeral of Morgan Barnard in Dungannon yesterday. Picture Mark Marlow. Inside the church mourners crammed into tightly packed pews while in places mourners stood two deep along the aisles as Morgan’s remains were carried to the altar. Among those in attendance were Irish children’s minister Katherine Zappone and Fermanagh South Tyrone MP Michelle Gildernew. Local councillor Barry Monteith, who attended all three funerals, said it was a “very sad day in the history of the town”. The St Patrick’s Academy school choir, which includes pupils and teachers, sang as mourners filed into the 19th century church. 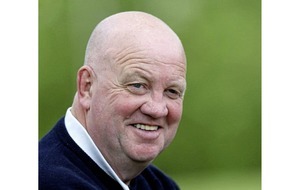 The funeral of Morgan Barnard takes place in the town of Dungannon, Co Tyrone. The teenager was killed along with two other teenagers Connor Currie and Lauren Bullock during an incident outside a hotel in Cookstown. Picture Mark Marlow. 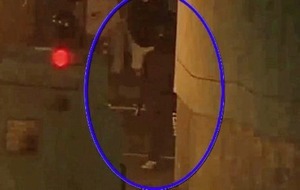 The anguished cries of his heartbroken mother, who is 17 weeks pregnant, echoed around the building as she was helped to her seat by the teenager’s father James Bradley. 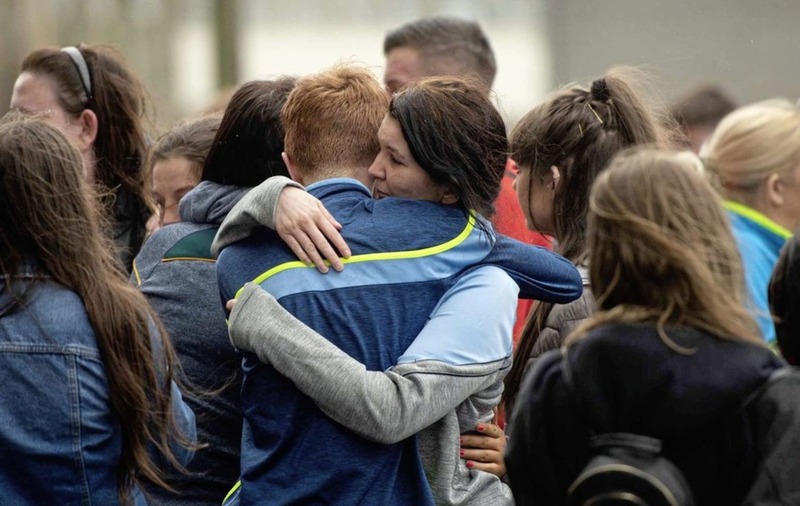 There was an outpouring of grief as large numbers of tearful teenagers, many wearing GAA tops, struggled to come to terms with the loss of their friend. Before Mass several gifts were brought to the altar and presented to chief celebrant Fr Aidan McCann. 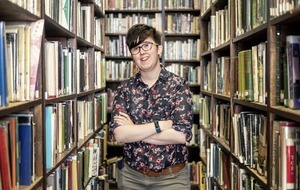 These included a framed picture of Morgan which included the St Patrick’s Academy crest and the words “Our dear friend Morgan”. A console game pad and pocket diary were also set out on a table at the in front of the altar. Speaking at the start of Mass Archbishop Eamon Martin said: "Words fail us at times like this. “Here in Co Tyrone this week - as families, parishes, schools and communities - we’ve been circling each other around with love and faith and kindness and compassion,” he said. "The shocking events of Sunday last have reminded us that life is very fragile; we need to cherish every moment and always look out for each other, and keep each other safe." The Archbishop thanked everyone for attending. “Thank you all for being here today to offer your prayerful presence and support,” he said. Fr McCann spoke in glowing terms about the teen. “To say that Morgan was well liked would be an understatement,” he said. “He was a vivacious, charismatic and energetic young man who nobody had a bad word to say about. He said the teenager had always had a listening ear. “He was constantly breaking his glasses and his mother was constantly having to buy him new school shoes as he wore them out playing football,” he said. The priest drew laughs from the congregation when he recalled the teenager’s sense of fun and mischief. The priest added that Morgan loved his school, ” his friends and teachers there; and the Academy loved him too - and so it is fitting and very moving that he is buried wearing the Academy Crest on his heart”. During bidding prayers Elliot Barnard spoke of his love for Morgan, who he described as his best friend. Later a schoolboy bravely struggled to read out a tribute in Irish to the teenager. As Morgan’s remains were being carried from the church heartbroken friends wept openly before the cortege made its way to a nearby cemetery for interment. There his mother was inconsolable as her son’s remains were lowered into the grave before she was led away by loved ones.